Labradorite is a Feldspar mineral (formula: [(Ca, Na)(Al, Si)4O8], which is the most abundant group of minerals that can be found in the earth’s crust. It is an intermediate to a calcic member of the plagioclase series and is most often found in mafic igneous rocks such as basalt, gabbro, and norite. It occurs as clear, white to gray, blocky to lath-shaped grains in common mafic igneous rocks such as basalt and gabbro, as well as in anorthosites. The stone, usually gray-green, dark gray, black or grayish-white, is composed in aggregate layers that refract light as iridescent flashes of peacock blue, gold, pale green, or coppery red. Color: Gray, brown, greenish, blue, yellow, colorless. It has an anorthite percentage (%An) of between 50 and 70. The specific gravity ranges from 2.68 to 2.72. The streak is white, like most silicates. As with all plagioclase members, the crystal system is triclinic, and three directions of cleavage are present, two of which are nearly at right angles and are more obvious, being of good to perfect quality. 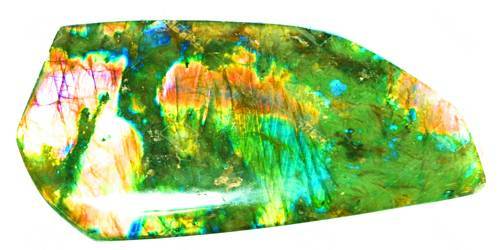 Labradorite occurs in mafic igneous rocks and is the feldspar variety most common in basalt and gabbro. The geological type area for labradorite is Paul’s Island near the town of Nain in Labrador, Canada. It has also been reported in Norway, Finland, and various other locations worldwide. 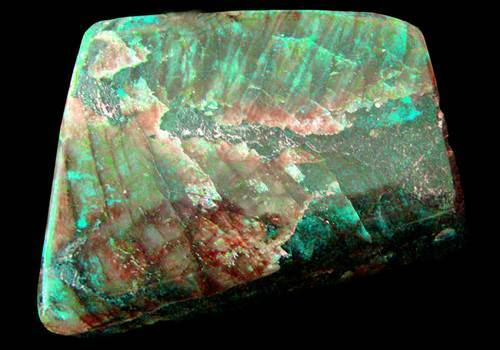 The uncommon anorthosite bodies are composed almost entirely of labradorite. It also is found in metamorphic amphibolites and as a detrital component of some sediments. Common mineral associates in igneous rocks include olivine, pyroxenes, amphiboles and magnetite. Uses: Labradorite is used as cabochons and beads, mainly for necklaces and bracelets, but is also faceted for rings and cut into ornamental objects and spheres. It is often heavily flawed with internal dark lines and streaks; stones that are clean of flaws are rare.